If anyone jumped to conclusions after the poor performance in Denver last week, I hope Friday’s game eased your worries. 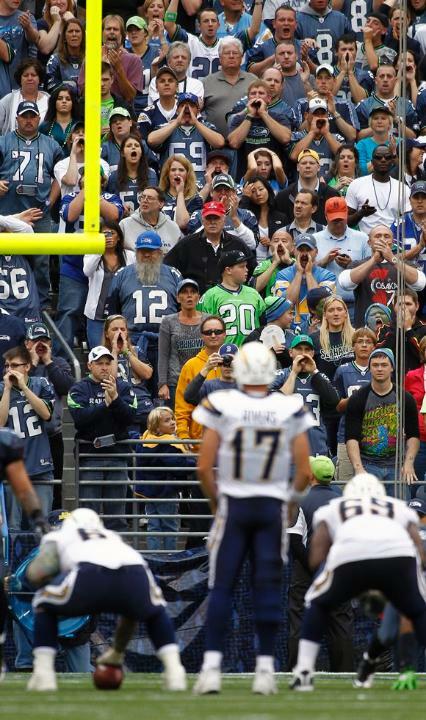 In front of a revved up 12th Man the Seahawks dominated the San Diego Chargers 41-14. 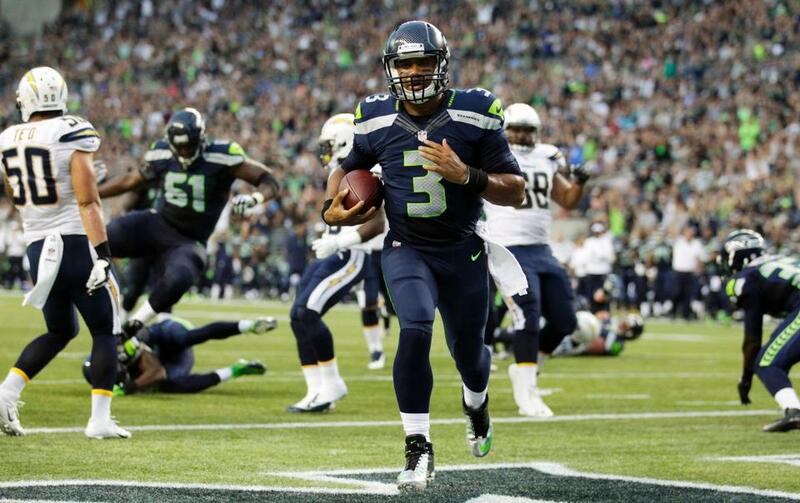 The Seahawks improve to 1-1 on the preseason while the loss drops San Diego to 1-1 as well. It was great to be back at CenturyLink Field and it was made even better given what occurred on the field tonight. Here are some of the things I took away from tonight’s game. Wilson Thrives: Russell Wilson played for the first 25:55 of the game and he was able to successfully lead three scoring drives, resulting in 24 first half points. Wilson appeared to be in mid-season form and his stat line reflected such a notion, completing 11 of 13 passes for 121 yards. What impressed me was his ability to once again evade the pass rush and use his feet to make big plays happen. Wilson found tight ends Zach Miller and Luke Willson for large gains and after scrambling, found wide receiver Doug Baldwin in the back of the endzone for a touchdown which was later overturned. DangeRuss was even more dangerous on the ground, running in two touchdowns of his own. What was even better was that Wilson proved that the read option attack can still be very effective. After not using read option nearly as much in 2013 as we did in 2012, I am starting to wonder if the read option will make a triumphant return in a big way in 2014. Next week Russell Wilson will play into the third quarter and with a performance similar to Friday night’s, next week’s game could end in similar blowout fashion. Turbin Steps Up: In my game preview I wondered about the possibility of Robert Turbin not making the team if he failed to put together a solid game this week. I am now thinking Turbin’s job is safe. After Marshawn Lynch was on the field for only the first offensive play of the game, Pete Carroll and Darrell Bevell handed the keys to the car over to Turbin and he definitely made the most of his opportunities, rushing for 81 yards and a touchdown on 12 carries. Two things impressed me about Turbin’s performance on Friday night. First off, he found holes extremely easily and did not try to run through people has he has shown in the past. Secondly and perhaps more importantly, Turbin fought for extra yards several times which is something that is rather rare for a guy that has shown his running style is closer to Shaun Alexander than to Marshawn Lynch. I think Turbin’s performance against the Chargers solidifies him as the backup running back but I wouldn’t be surprised to see Christine Michael get the bulk of the carries next week to try to challenge Turbin yet again for that job. 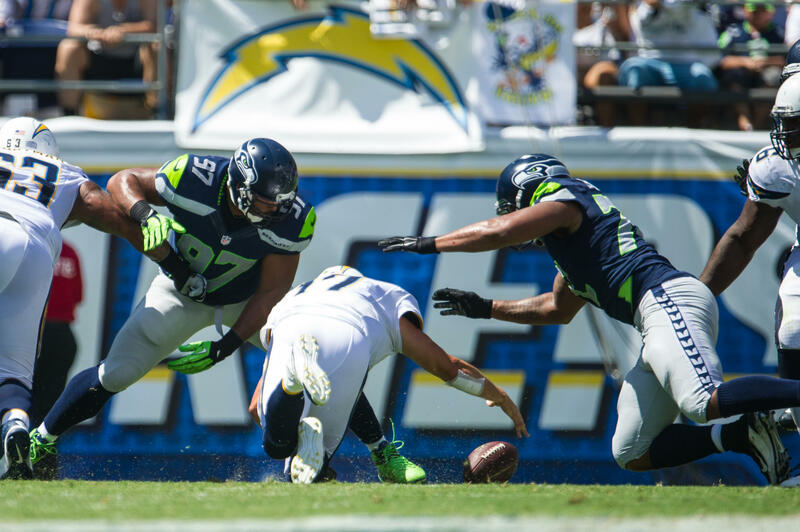 Offensive Line Holds its Own: Despite the fact that Russell Okung and Max Unger sat out Friday’s game, the Seahawks makeshift offensive line did a fantastic job creating room in the running game and keeping Russell Wilson and the rest of the quarterbacks clean. The play of tonight’s o-line paved the way for 243 rushing yards, 5 touchdowns, and only one quarterback sack. What makes me breathe a sigh of relief is that this unit is going to get better once we get Okung and Unger back as well as solidifying who will be out starting right tackle come September. Jackson vs. Pryor (Round Two): This topic is difficult to discuss because Tarvaris Jackson did not play. Terrelle Pryor got the second-string snaps and did an adequate job. His stat line through the air was not entirely impressive (1/4, 10 yards passing) and there is much room for improvement in that area but Pryor did impress me with his feet, running for 59 yards and a touchdown. One thing I would like to see Pryor improve on is his awareness of the line to gain after he slid just short of a first down in the fourth quarter. Pryor is improving but I discussed with a guy at the game it is possible that we gave him ample playing time tonight just to see if it is worth it to keep three quarterbacks on the roster after the preseason. Defensive Thoughts: The defense showed significant improvement as a whole unit from last week to this week. I am becoming a big fan of middle linebacker Brock Coyle’s playing style after he contributed to nearly every play he was on the field for. Jeron Johnson also really impressed me in the secondary after he made a couple of Kam Chancellor-esque hits on Chargers receivers. Johnson moved from cornerback to safety this offseason and it is clear that Johnson will be Chancellor’s backup this season. The defense fed off the energy of the 12th Man all night long and confirmed my belief that we have the best defense in the National Football League especially when we play at home. 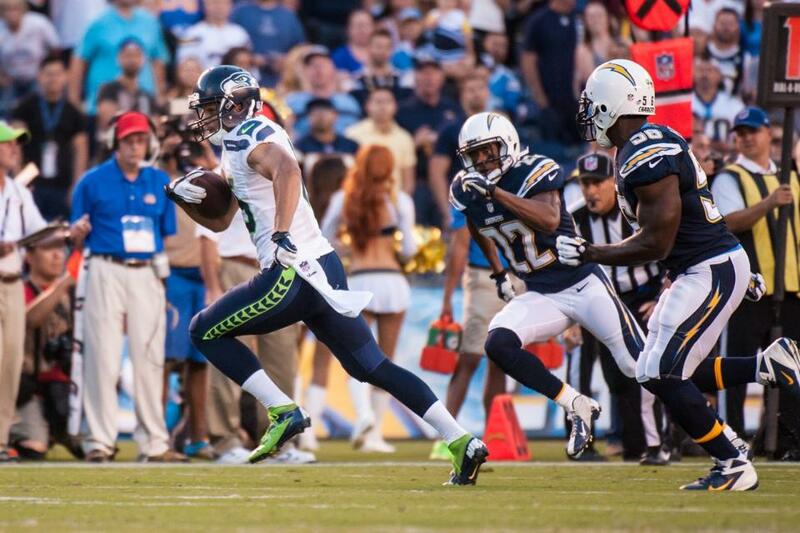 Thoughts on San Diego: The San Diego Chargers offense is a unit that is very hard to diagnose. Starting quarterback Philip Rivers played only one series before backup Kellen Clemens took over and Rivers looked fairly mediocre. San Diego’s receivers and running backs have great potential but Rivers will have to have another solid year for the Chargers to consistently put points on the board and in essence, remain competitive. The San Diego defense needs a lot of work, especially in the running game. The Chargers will face many elite running backs this season such as Marshawn Lynch, Jamaal Charles, and Frank Gore. 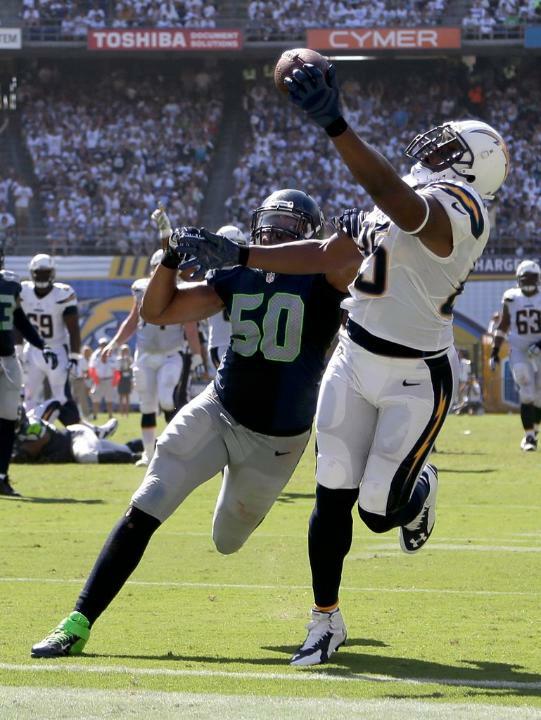 It will be a long season for the Chargers if they cannot fix their glaring defensive problems. Random Thoughts: All blue for the Seahawks and white/navy for the Chargers just like I thought… The raisers of the 12th Man flag were first responders of the Oso mudslide and the Eastern Washington wildfires… One interesting note, the Seahawks are starting to shy away from the phrase “12th Man.” The fans were referenced as “12’s” and the flag was referenced as the “12 flag” instead of the “12th Man Flag” by the public address announcer… For a short time before heading downtown it felt like it might be in store for that weather uncertainty I hate so much; when you don’t know if you want to bring a sweatshirt because it might be too cold but you don’t want to be stuck carrying it everywhere if it is too warm. Those kinds of games are the worst… We went to Hawks Nest Bar and Elysian Fields before the game but since I’m on antibiotics I couldn’t drink. Instead, I had the best couple of Diet Coke’s I’ve ever had… I almost witnessed a fight during on the concourse during halftime. I went to get a bite to eat and there were two guys who were circled up and they looked like they were about to box. When I walked past the same area after getting my food, the area was patrolled by about a half-dozen police officers with both fist fighters leaning against separate walls, handcuffed. Don’t be stupid at sporting events boys and girls… In the rafters was a banner covered up by a black tarp. After seeing it before the game I assumed that the Seahawks were going to raise our 2013 NFC West champions banner but they held off. We’ll see if any banners are unveiled next week… CenturyLink Field made a couple of significant upgrades over the offseason. The scoreboards hanging off of the upper deck at midfield now display a new design. The old design consisted of the both team names and their respective scores, one on top of the other, on a football texture background. The new scoreboard display is navy blue with both team logos and their respective scores side by side with the score in the team’s color scheme. (For example the Chargers score was displayed with the lightning bolt and yellow score number. The Seahawks score was displayed with our logo and our score in action green). Also, the stat boards in both endzones have been replaced with new video boards, giving the stadium 6 video boards instead of just 2. They are very bright and beautiful. They are certainly noticeable and I personally like them a lot. Check back next Thursday as I preview our third preseason game, the dress rehearsal game, against the Chicago Bears. Go Hawks!